Thread: Here is BOZO ! Re: Here is BOZO ! Very nice! I can see this one not only catching stripers, but nailing some saltwater game like sailfish, tuna, and mai mai! 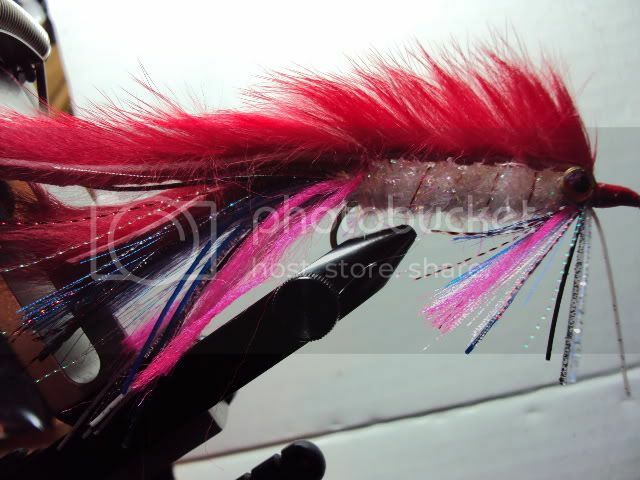 I'm not a fly fisherman but that is cool looking. I bet in a shad color scheme with some red on the neck that Bass would eat it up. Things are multiplying like rabbits ! I have some that want to ride to Gunthersville with you ! Dude, That's the beauty of the HH ! You do not have to be a fly fisherman ! The larger ones are easy to cast with a spinning rod ! I think they will do great with a very slow retrieve while varying the speed with a slight jigging action !!! When I get a chance , I will work on one like you described. Yes.....I promise to take good care of them! Although, I can't say how the bass might treat them! Can I feed them after Midnight? (Gremlins) LOL! LMAO ! Not sure about that one Feed them at your own risk ! LOL! Just checking, cause I might need some extras while I'm out there at G-Ville.....LMAO! Hedge Hogs and Harleys, kinda makes the head spin..............in a good way......lol.